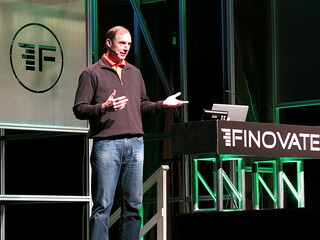 Last week, we unveiled our new family pack of prepaid cards at FinovateSpring 2013, the demo-focused conference for innovative financial and banking technology. We were honored and delighted to be voted by the audience as one of 5 Best of Show recipients out of 72 presenting companies. In case you didn’t get a chance to catch our demo, or you just want to examine it more closely (because you were busy sending snarky tweets, or you tuned out as soon as you saw the Biebs, or you just plain nodded off), I’m posting a rough transcript below. I say “rough” because I don’t memorize my scripts word-for-word for two reasons: 1) I’m completely incapable of doing so, and 2) it tends to kill the mood. Compare with the script below to see where I ended up winging it. Oh, hey. I was just checking out the Biebs. Catchy lyrics, huh? OK, I’m not even totally sure I know what that means, but as a father of 5 (4 teens so far), I think I have a pretty good inkling. Did you know that almost 250 million kids have watched that video? Amazing, if not scary. But I’m not here to talk about teen pop stars today. I’m here to talk to you about teaching kids good money habits. How do parents do that? Well, I think part of it is having a solid financial role model. Someone who reinforces good, responsible money behaviors, like moderation and delayed gratification. I think another part is lots of hands-on practice. That’s key to mastering any skill. So, what if we could roll those two things together into a custom, educational banking experience designed specifically for kids? A place where our kids could repeatedly practice handling real money while immersed in the positive imagery of a responsible role model. It would be like financial training wheels for adult banking. Wouldn’t that be awesome? Well that’s exactly what FamZoo lets me do. I can set up a custom, private, virtual banking system for my kids. For example. 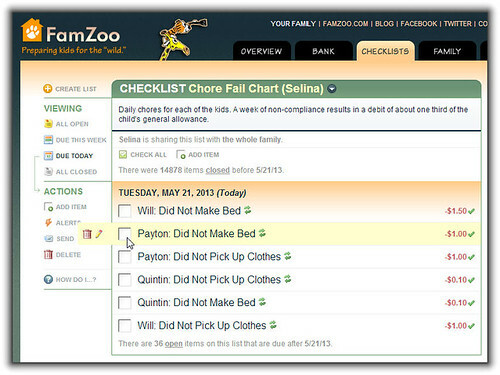 check out what I’ve set up for my teenage son, Payton, in FamZoo. Here I am signed into my very own private virtual family bank — the “Dwight Family Bank”. You can see all our family members over here in the sidebar. I’m signed in as me, the dad, so I can see all my kids’ accounts as well as my own. When kids sign in, they just see their own accounts. By the way, notice this lower sidebar area, the upper banners, and the branding. 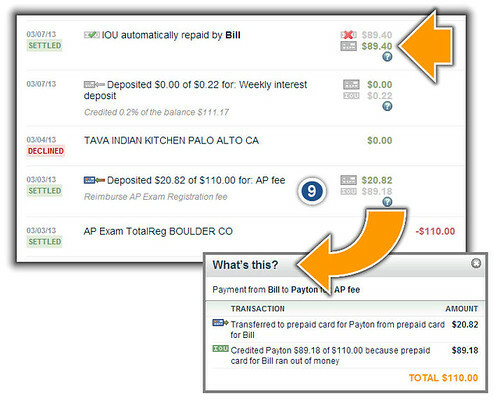 That can all be customized by a specific partner — like a bank or a credit union — using our Partner Edition offering. More importantly, individual families can customize the experience for their kids based on their own unique values. So, I’ve created a spending account for Payton, and called it “Spend like a pop star”. 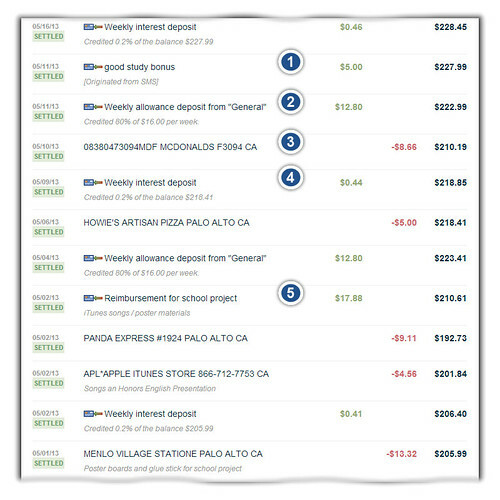 We’re looking at the online view of that account’s transaction history right here. FamZoo lets me customize the account description for my son, so I’ve done that and have embedded a cool video featuring our esteemed teen pop star money mentor. I even gave my son a prepaid card featuring that very same financial role model. That way, whenever he’s is thinking about money, he’ll be encouraged to emulate the behaviors of a teen pop star. Let’s look at some of his transactions to see how it’s going so far. I figure kids love their independence, so I let him loose with his card and a $1,000 a week allowance for babes, bling, or whatever. I just get out of the way. Kids can’t stand it when parents interfere in their lives — they just want to be left alone with their peers. Is that so wrong? OK, before you go sending any snarky tweets, let me just say that this is obviously absurd. I mean, no parent wants their kid emulating a teen pop star when interacting with money. Right? and using prepaid cards as a stepping stone to checking accounts and credit cards. I just wouldn’t structure it this way. So, let me show you the custom banking experience that I really set up for my son, and that we’ve been using together for the last 6 months. One of the first things you’ll notice: this isn’t an isolated teen prepaid card. We’ve built something really cool and unique using the API to TransCard’s prepaid card platform. 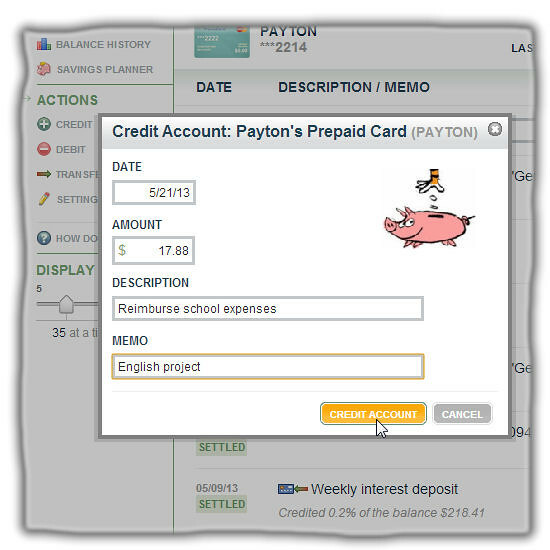 Payton’s card is part of a group — or a family pack — of prepaid cards that we use together. You can see my card on the left here. I load my card up periodically from an outside source through a bank transfer, or a MoneyPack, or, if I want to load it for free, I can use Dwolla. Then I use my card as the funding source for a whole bunch of micro-transfers to my son — payments for allowance, chores, reimbursements, etc. And, sometimes, money even flows in the other direction from my son’s card to my card — for penalties or bill payments when he picks up his share of expenses like his cell phone data plan. The great thing is that all of those micro-payments back and forth are card-to-card transfers within TransCard’s platform. That means they’re all immediate and free. 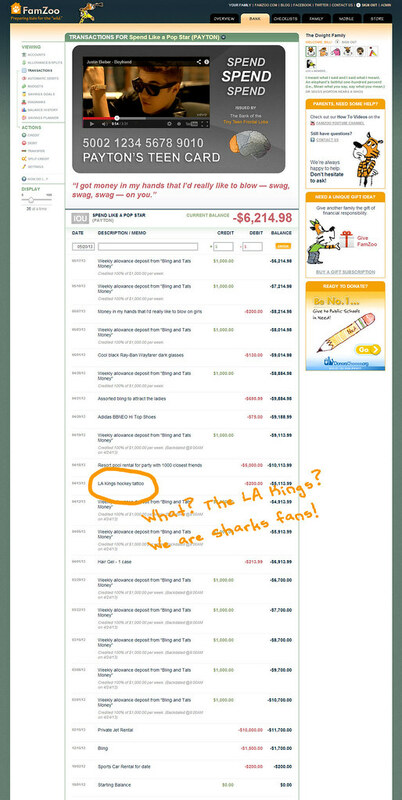 Before we walk through some recent transactions on my son’s card, let’s step back and look at his financial big picture by clicking on the “diagram” link in the left sidebar. 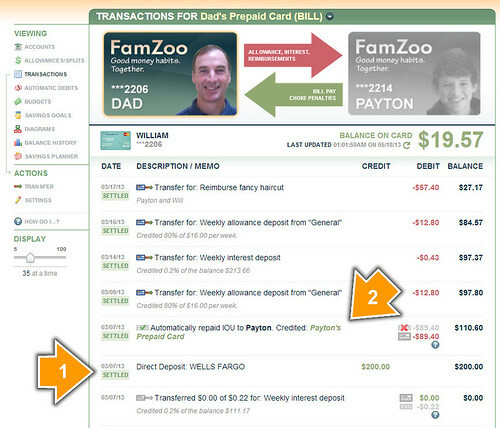 Now you can see how we’ve really set things up in our virtual family bank for Payton. He gets a modest allowance (not $1,000 per week! ), and 80% of it feeds into his spending card. The remaining 20% is split between long term saving and charitable giving. You can see the balance on his card has been trending up. Perhaps because of the 0.2% compound interest I’m paying him each week as a reward for NOT spending. Remember, that interest is defined and paid by me through an automatic card-to-card transfer which is immediate and free of fees. You can also see that he’s saving for a MacBook Pro as well, so that helps put a damper on the miscellaneous spending too. As for money coming out, he’s got some regular automatic monthly bills to pay his parents for the iPhone data plan and the phone insurance. These are also free and immediate card-to-card transfers, but in the opposite direction. So, he needs to plan ahead to make sure he’s got the balance to cover those expenses at the end of each month. Now, let’s go back and take a look at Payton’s transactions to see how this has all been playing out recently. I’m going to highlight 9 transactions. I recently shot him a $5 bonus with a text message from my cell phone for memorizing all the U.S. President’s names — an extra credit exercise for his History class. I was very impressed by that, since I can barely remember the names of my 5 kids. 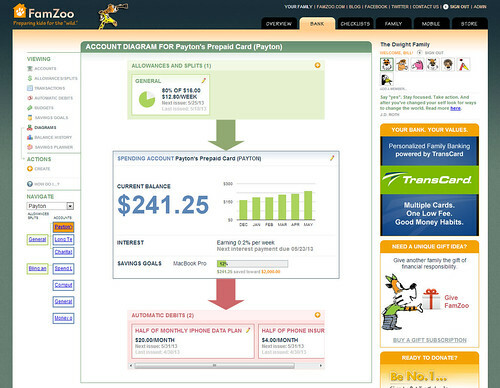 Next, you can see that his allowance was automatically delivered by FamZoo, with 80% of the total going to this spending card. That’s an automatic transfer from my funding card that happens each week. Then you can see a typical teen purchase for some McDonald’s fast food. Since the FamZoo cards are MasterCard® prepaid debit cards, they’re accepted pretty much everywhere — both online and in stores. That’s really crucial when it comes to accommodating typical teen spending destinations. Notice that I can drill down on the detail by clicking on the little “settled” icon to check out what time the purchase was authorized. Good. Not during class hours! Next, you can see the automatically delivered weekly interest payment that I’m paying my son to encourage him to maintain a healthy balance on his card and generally spend less. It’s a parent defined savings reward. Here’s a really common scenario: I’m reimbursing Payton for a couple items he bought for a school project. You can see the two purchases just below. OK, at least, he said that iTunes purchase was related to his English presentation. At minimum, it was a creative story, so I’m rolling with it. To reimburse him, I just click on the credit link to enter the transaction description and amount. Behind the scenes, the amount is transferred immediately from my card to his. Here are the automatic debits for the “child bill pay” that we discussed earlier — one for Payton’s monthly share of the iPhone data plan and another for the monthly installment of his cell phone insurance. He needs to plan ahead a bit to make sure he has enough on his card to cover these payments to me at the end of each month. You can group a set of single and/or repeating items onto a checklist, and each item can optionally have associated rewards and/or penalties. Here’s something cool. Each of the cards has an associated account and routing number pair, so you can set up direct deposit right to a family pack card. This can be really handy. For example, I wanted my son to learn how to do his taxes online with TurboTax. This isn’t your most compelling teen activity! But, when I told him he could get a nice refund for his summer job and have it delivered directly to his card, he quickly changed his tune! And, finally, I saved the coolest transaction for last. My son registered for his AP exam online with his card, and I needed to reimburse him for the $110.00 fee. Unfortunately, when I tried to do so, I was short of funds on my card by $89.18. Uh oh. Look, I missed a subsequent automatic interest payment as well. No worries! FamZoo detects whenever I run short of funds on payments to my kids and automatically creates and tracks the appropriate IOU amounts. As soon as I get around to reloading my card again, FamZoo automatically repays any IOUs that I have outstanding to my kids, like it did here after I reloaded my funding card with a transfer from Wells Fargo. You can see what it looks like over on my prepaid card. 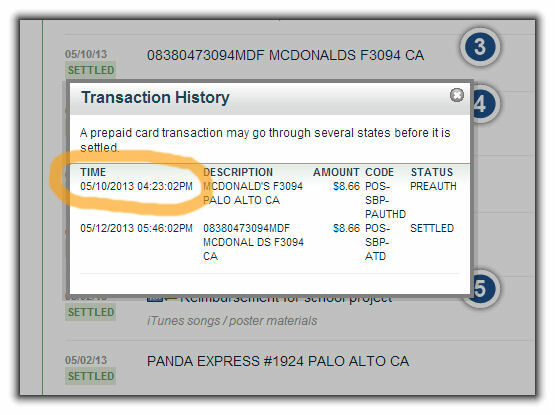 I can jump to the related transaction on my card by clicking on this little card icon. Here, you can see the load from Wells Fargo followed immediately by the automatic IOU repayment to my son. 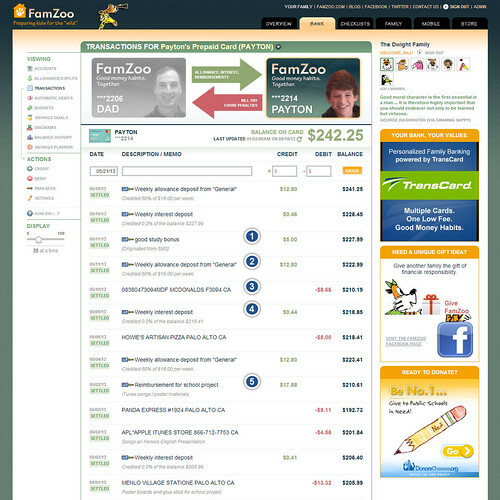 The bottom line: you don’t have to be the perfect financial role model to use FamZoo effectively with your kids. You just have to care a little bit more about your own kids’ money habits than your typical teen pop star does. We’ll help you with the rest. So that’s what our new offering is all about: a customizable family banking experience built on a group of prepaid card accounts that parents use together with their kids to teach good money habits in a way that’s consistent with their unique family values. All for one low monthly fee that covers every card in the family. Multiple cards. One fee. Good money habits. Together. If you’re a parent, swing by the booth and find out how to get in on our sweet promotional offer for the first 1,000 prepaid card family packs. If you’re a potential partner, come by and let’s talk about how you can offer virtual family banking as a new product to your own customers. I can show you what I didn’t have time to show here: how easy it is to customize the branding and how to place targeted offers inside the app. Otherwise, just drop by and grab some FamZoo cartoon stickers. They’re always a hit with any age, and they’re a lot easier to remove than an LA Kings tattoo.